Do you have a student ready to spend the next four years as a UNF Osprey? SWOOP and Welcome to the Nest! The next four years will be some of the most amazing times for your student, and without a doubt for yourself as well, in the Jacksonville area. Jacksonville, perfectly positioned along the Atlantic Ocean in northeast Florida, is a natural paradise. Otherwise known as the “River City by the Sea”, this beautiful city boasts more than 20 miles of wide and uncrowded beaches, close to 40 miles of the tranquil Intracoastal Waterway canal, and the longest stretch of the beautiful St. Johns River. Jacksonville is home to the largest urban park system in the nation, with 10 state and national parks. Its authentic cuisine, incredible shopping areas, historic district and more, “Jax” is definitely making its mark on the map. There is something for everyone in the Jacksonville area. Art, history, music, and sports are an everyday/everywhere occurrence in Jax. The area hosts the Jacksonville Symphony, Jacksonville Jazz Festival and the nationally known NFL football team the Jacksonville Jaguars is just a 15-minute drive away. Some fun facts about the University of North Florida. UNF originally opened its doors in October of 1972 to 2,027 upper division and master’s level students. The school was originally intended for commuting students. In fact, most of the faculty were actually younger than the students. It wasn’t until 1984 that the first class of freshmen and sophomores were admitted with the first dorm being opened in 1985. Today, UNF has come a long way with over 16,500 students and always makes students their top priority as evident in their motto “No One Like You. No Place Like This”. UNF has students from all over the United States and more than 70 foreign countries organized into five colleges which offer 53 undergraduate degree programs and 28 graduate degree programs. They have 220 clubs and organizations for students as well as an active Student Government and Greek life. 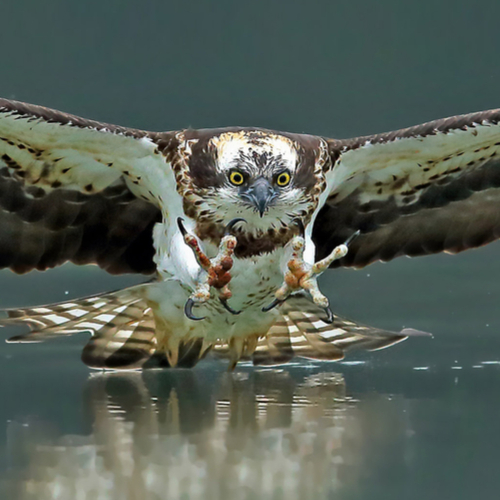 Why the Osprey? When the University of North Florida first opened there was no need for a mascot because the school did not participate in intercollegiate events. The selection of a mascot started innocently by Dorreen Daly, editor of the UNF alumni newsletter in 1978. Ms. Daly was searching for artwork to accompany a story she was writing for the school. She jokingly represented the mascot as an armadillo which students and locals did not like! In the spring of 1979 as an addendum to the election ballot, the UNF Student Government Association conducted a referendum for selection of an official mascot. By this time, the seagull had become a contender, along with the manatee and the armadillo. After conducting some preliminary research and talking to colleagues, Dr. Ray Bowman, a member of the faculty in the Department of Natural Sciences Bowman decided the osprey would make a better mascot than any of the others proposed and conducted a one-man campaign for the osprey as UNF’s official mascot. Dr. Bowman spent his own money to print fliers and posters listing the virtues of the osprey. The osprey garnered 47 percent of the vote over the seagull, the armadillo, the manatee and a host of other challengers. Thus, the osprey was “hatched” as UNF’s official mascot.